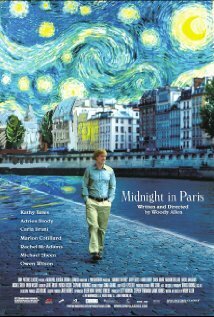 Midnight in Paris is Woody Allen's latest film, an enchanting tale of self-discovery and ode to living in the Now. It stars a very charming Owen Wilson as Gil, a Hollywood screenwriter engaged to Inez (Rachel McAdams), visiting Paris on a business trip with her stuck-up parents. The opening sequence was picture postcard perfect, clearly another one of Mr. Allen's love letters to a great city. Increasingly dissatisfied with his career, Gil is trying to finish a novel. He is nostalgic for what he considers the Golden Age, the Roaring Twenties. He is enthralled with the City of Lights and can see himself living there. His self-absorbed fiancée has very different plans for their future together. If not out shopping with her pompous mother, Inez spends time with Carol (Nina Arianda) and an old professor of hers (a wonderfully arrogant Michael Sheen). After he declines an invitation to go dancing with Carol and Paul, he drunkenly wanders the streets and finds himself picked up by a mysterious vintage car at the stroke of midnight. He is brought to a party where he meets F. Scott and Zelda Fitzgerald (Tom Hiddleston and Allison Pill), Cole Porter (Yves Heck), and Ernest Hemingway (Corey Stoll). His midnight strolls become a nightly thing, and pretty soon, he is getting literary advice from Gertrude Stein (Kathy Bates), and crossing paths with Salvador Dali (a very amusing Adrien Brody), Pablo Picasso, and more importantly, his lover/muse/model Adriana (Marion Cotillard). Gil is captivated by Adriana, who herself wishes she could have lived during La Belle Epoque. Meanwhile, back in the present, things look worse and worse when juxtaposed with his alluring Parisian nights spent with artists, philosophers, and writers. I won't divulge the other 1920s icons that he meets so as not to spoil YOUR viewing experience, but each encounter was entertaining and clever. Also be on the look out for France's First Lady, Carla Bruni. The supporting cast must have had so much fun shooting this film. The film is not only a celebration of life, creativity, art, and culture. Our hero learns that while it is not necessarily bad to idealize days gone by, one runs the risk of missing out on the present. So Carpe Diem, No Day but Today, Be Present, and all that. Enjoy this fanciful work of art from Mr. Allen.